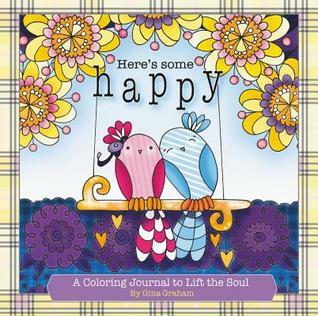 HERE'S SOME HAPPY, filled with charming, whimsical illustrations throughout, combines the joy of coloring with the peacefulness of journaling. Enjoy 128 pages of whimsical illustrations to color and journal within; perforated pages for easy removal and display; and Scripture to reinforce the message of God's love. One of my favorite new coloring books is called Here's Some Happy by Gina Graham and it is very unique unlike most coloring books. Most coloring books are paperback, but not this one! It comes in a beautiful hardcover! I love that you can travel with this coloring book because you don't have to worry about a hard surface. You have it underneath the pages! The coloring pages are beautiful and each page has beautiful scriptures geared towards the pictures, which also have a spot of you to have personal prayer time after mediating on the word of God. This coloring book can be used as a prayer journal, which is very unique. The coloring book says Color, Journal and Smile, which is exactly what you do when you're done. I think this is a such a way for you to relax, pray, journal and listen to the voice of God in a unique way. Personally, I use color pencils on this coloring book, but you could also use markers too. I received Here's Some Happy by Gina Graham compliments of Faith Words, a division of Hachette Book Groups. A favorable review was not required. I give this coloring book 5/5 stars.